Seventy years ago today, on August 13, 1945 my father John Webster — as a 21-year-old US Navy radioman on Guam — was involved in sending the message from the US Navy to the Japanese Imperial Navy on how to reach them for surrender talks. A few years ago, my mom showed me a scrapbook she put together before my father’s death in 1997 documenting his life, including his 29-year Navy career. It contains the copy of the transmission he helped send out on 13 August, 1945 — just a few days after the US dropped atomic bombs on Hiroshima (8/6) and Nagasaki (8/9). “BT” means “break transmission” and is used to signal the beginning and end of the actual message text. 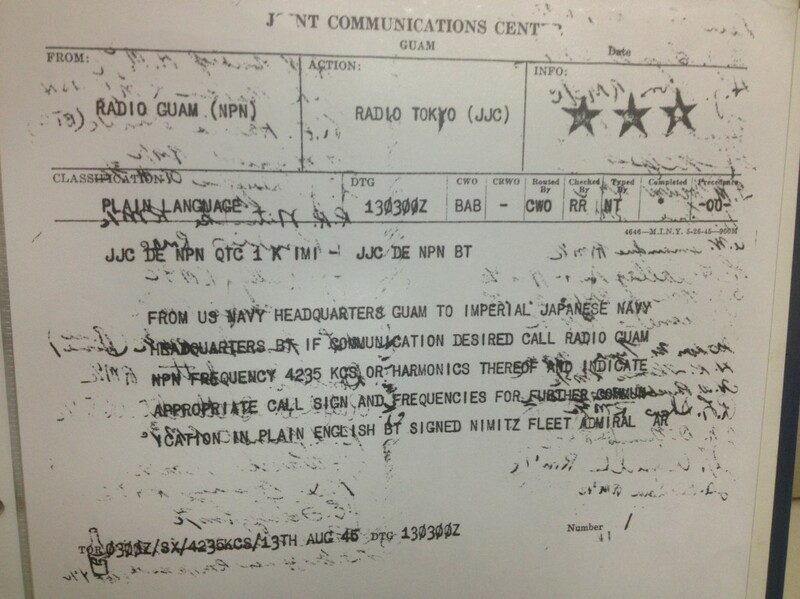 The writing that is showing through from the backside is from the signatures of the other radiomen on Guam involved. They knew the war was about to end. ..bruce..
That is, simply, awesome. To have finally seen the end of hell. « Hillary House Party music video!